These steps are for FiberHome AN1020-25 ADSL Wireless Modem provided by PTCL Broadband. Click on “Add” and enter the Local IP and Port you want to forward. Here I am forwarding Port Number 27015 of UDP which is default port for Counter-Strike 1.6 Server. As of March, 2015 PTCL has blocked port forwarding for Dynamic IP DSL connections. 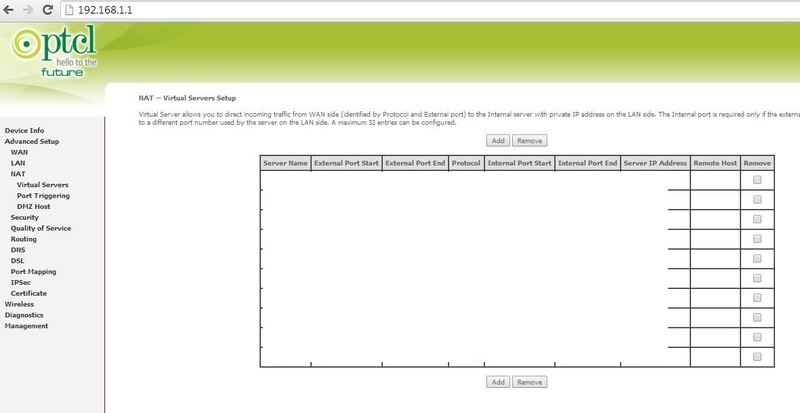 For Port Forwarding to work, you must order Static IP from PTCL. Ws. Its not called trigger its called “Port Forwarding”. There is a big difference between these two things. The above method works for TP-LINK also but you will need to guess the similar looking menus by yourself. Feel free to message me on http://www.facebook.com/AskTaimoor if you get stuck some where. All you can do is ask your service provider to do it for you! using evo ptcl and i dont have the option of TCP UDP etc. Can you make PDF to help about “Port Forwarding” ?? You can convert this tutorial to PDF using online tools yourself. If you need a complete detailed tutorial you can find it on the website of your router’s vendor. Well if you want really good download speeds Zong and other 4G provides are good. But that will cost you high pings and download limits / bandwidth caps. If you opt for good ping / latency for good gaming experience, PTCL and other cable based ISPs are the right choice. Taimorr i have port forrward on 192.168.1.5 first it worked but now i am again port forwarding on 192.168.1.7 and it isn’t working why? Make sure you have deleted the previous port forward rule before creating a new one with same port. Also change your LAN IP to static so that it does not change from 192.168.1.5 to some other IP in future. If you are using PTCL, this might not work because PTCL has changed their policy and now they only allow port forwarding on Static IP connections. is there anyway i can create an internet server for CS by using non-static ip? ?…last year i used “Hamachi” to play with my friends..but i am unable to do that now….. Yes you can play using Hamachi or other VPNs as long as all your friends are on the same VPN network. This will be a free setup. Another option would be to buy an online VPS and setup a CS server on it. This will cost you around 15$ per month. if we are connected on hamachi and i create a server, which IP i will give to my friends??? my local lan, my internet ip , or the ip hamachi have given to me?? excuse me sir your some admin gone mad they are banning player without any reason!!!! I am really sorry if that happened. Which admin(s) are doing that and in which server? What is your game nick and when did that happen? I can’t understand how PTCL can block port forwarding for already installed routers unless they remotely updated routers’ configurations (probably using TR-069 client feature available in the router). 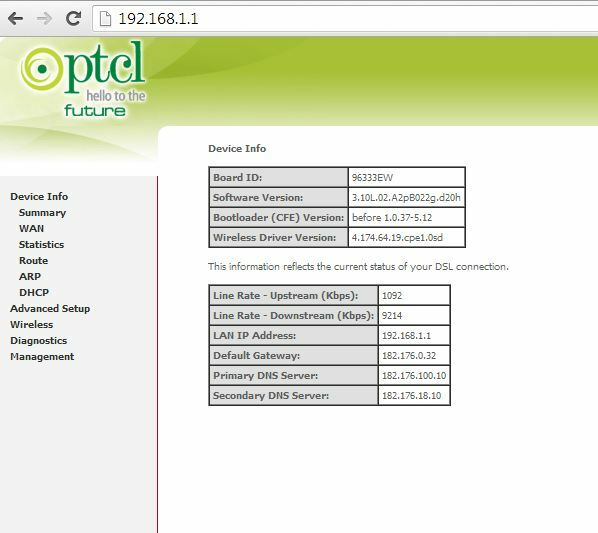 Has any one of you tried configuring port forwarding on non-PTCL routers after March 2015 without a static IP address from PTCL? It doesn’t depend on your router manufacturer or anything. They block it on their core network level e.g., at the BRAS / EDGE routers. No. They are not blocking it on their side. They are doing it at router level, as today (16-10-2015) I’ve successfully forwarded the port using dynamic IP address on a TP-Link router purchased from the market, instead of the one provided by PTCL. Also, one of my friend did the same using a 3+ years old PTCL provided router. So the culprit is the new router provided by PTCL that can be remotely manipulated by them. If you use your own router then there is no need to get a static IP address from PTCL for port forwarding to work. Maybe they have removed that restriction now. I will confirm that soon and update the post if needed. CHAT STARTED AT 6:00 PM, 02 Sep 2016. Salam taimur. I have left u a msg on fb. I have ordered static ip from ptcl now. But still cant open ports. Have tried alot of solutions but nothing working. Ports remain closed. Can u assist pls. Static IP is not applied instantly and it usually takes 3,4 days to setup sometimes. So you might be facing this issue because maybe your Static IP is not setup yet. Another possibility is that PTCL might have blocked the specific game port you are trying to forward. This has happened in past with some games as per my research. On more unlikely reason for this could be that you haven’t properly configured your router firewall or your computer’s firewall or that you haven’t forwarded the ports to the proper LAN IP in your router. Try with another browser and make sure you are taking too much time to fill the details. The session is expired after a few minutes so try to be quick. If the above methods don’t work, it means your router is faulty and you need to get it replaced! Bhai mein nay apnay PTCL ka Port Forward ker na hay PTCL ki ab settings change hogai hein. Please meri help karain my Ip is 192.168.10.1. Yeh jo apnay tareeka Post kiya yeh poorana hogiya hay. aap mujhay nya tareeka send kereen Please. Nope I don’t see anything changed. I am using exactly the same setting since 2010 and this is my 4th router since then. Contact me on facebook.com/AskTaimoor I will try to solve your problem. Sir…. My Port Forwarding Says This Message Invalid Session Key, Please Try Again Later What is this Problem ?? Why This??? The only solution to this problem is to get your router replaced. This is a bug in router’s firmware or the router it self! zong 3G wingle se server kaise banay ga ? You will only need to open your firewall ports. Confirm from Zong whether they allow incoming traffic on ports or not! My friends cann’t connect to my HLDS .?? Which internet connection are you using? Do you have static IP? Did you configured port forwarding properly and tested it? Try turning off your windows or any other third party firewalls. If you are still unable to solve the problem, mail me at and I will check the issue via TeamViewer! The procedure is almost the same. Mujhe ek problem ho rahi hai Counter Strike 1.6 ki ip forwarding me or me apne friends k liye ek private server banana chahta hn me ptcl charji evo 36mbps use kar raha hn agar aap meri koi help karden ya phir mujhe server creat karne ka koi or tareeka bata den to meherbani hogi..
Bro, i hv ZONG 4g Device How I can PORT Forward For Use Free Dedicated Sc ? Call Zong helpline and ask them whether they support port forwarding or not. Hi Taimoor, I have zong 4g device and even though my upnp setting is on and my connection is set to cone NAT instead of symmetric NAT, I still am facing problems using Game Ranger as it tells me that my connection is symmetric. And asks me to allow port forwarding but I cant figure out how to do that. I m unable to join this IP 193.192.59.222:27083.
shows server not responding while checking of gametracker.com its shows 90% player on this server.